Dr. Wei Fan, Momentive Performance Materials Inc. Automotive LED headlights present a thermal management challenge where conventional aluminum- and copper-based heat sinks limit the maximal power loading to LEDs. Thermal Pyrolytic Graphite (TPG*) materials are now being designed into high power LED headlight assemblies to help thermally manage LED (light emitting diode) heat. TPG* materials contain millions of highly-oriented stacked graphene planes forming excellent in-plane thermal conductivity (>1500 W/m-K) with very low density (2.25 g/cm3). TPG-metal composites can simultaneously achieve high thermal conductivity from the TPG core and high mechanical strength from the metal shell. 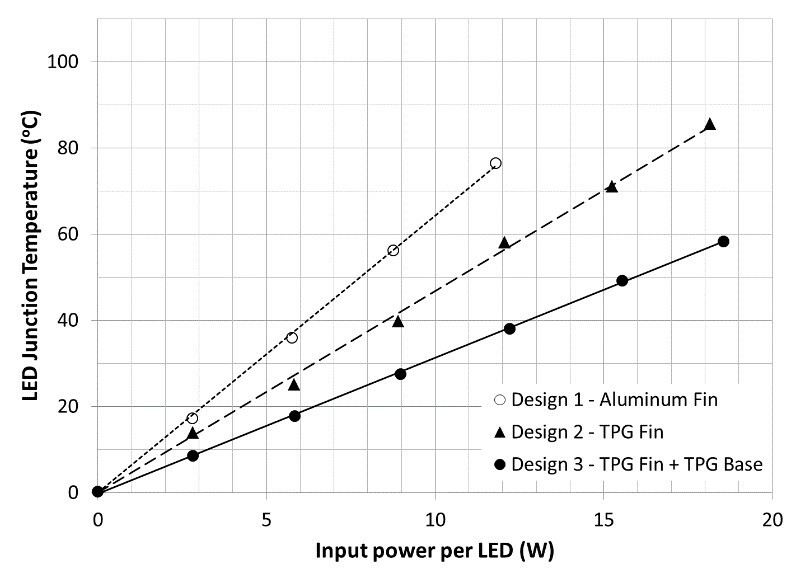 In testing conducted by Momentive Performance Materials Inc. (“Momentive”) on prototype headlights, data suggests that replacing aluminum fins with metallized TPG plates can reduce total system thermal resistance by 27%, and by inserting a TPG core underneath LED dies, an additional 24% reduction in thermal resistance can be achieved. Furthermore, testing of this integrated headlight assembly demonstrated that TPG material-assisted heat dissipation at these two strategic locations can allow for a twofold increase in power load to the LED. Various new bonding processes, including diffusion bonding, epoxy bonding, S-Bond soldering and brazing, have been developed to integrate TPG material into metal-encased TPG-metal composites, such as aluminum, copper, tungsten copper, molybdenum copper and ceramics made through encapsulation processes. TPG-metal composites typically behave like solid metal and can be further machined, plated or bonded to other components to meet various requirements. TPG-metal composites have been incorporated into Momentive’s TC1050* heat spreaders, TMP-EX heat sinks and TMP-FX thermal straps where they can quickly conduct heat away from the heat-generating sources; therefore, greatly increasing LED cooling efficiency and life. A baseline LED conventional headlight assembly (see Figure 1) shows the LED die bonded to a heat spreader and thermally connected to a cooling fin and active fan system. Thermal analysis of this baseline LED headlight indicated that integrating high-thermal conductivity TPG material into the aluminum heat sink base and aluminum heat sink fins could make the greatest impact in increasing heat dissipation of the LED headlight. Figure 1. The baseline LED headlight (VLEDS 9006) illustrating key components for thermal management. Next, TPG materials were integrated into various parts of a LED headlight assembly. In this study, three proposed designs were validated in simulation, built and then tested, as shown in Figure 2. In Design 1, the fin heat exchanger from the baseline assembly was replaced with straight aluminum fins with similar heat dissipation performance. In Design 2, the aluminum fins were replaced with Momentive’s TMP-FX thermal straps metallized with S-Bond solder. The high-thermal conductivity TPG material spread the heat more uniformly across the entire fin structure; thus, utilizing the fin surface more efficiently. The thin S-Bond coating not only protected the TPG material from moisture and abrasion, but also enabled soldering of TPG material directly to the aluminum base to minimize any interface heat resistance. Temperature mapping through measurement, as shown in Figure 3, revealed that a thermal resistance of 4.7 oC/W, which was 27% less than the measured resistance of Design 1, was achieved. as a function of input power per LED for the three headlight designs. Note: Test data. Actual results may vary. In order to facilitate the heat flow from the LED die to the heat sink fins through the narrow neck area, a T-shape TPG tile with 2 mm thickness, as illustrated in Figure 2 as Design 3, was embedded into the aluminum base. This TPG tile, which presented a thermal conductivity 8 times higher than that of aluminum, was first metallized and then brazed into an aluminum enclosure with a T-shape cavity at nearly 600 oC. High temperature braze joints between the TPG material and aluminum and between the aluminum enclosure components provided excellent thermal interfaces and high bonding strength. More importantly, the braze bond endured the downstream S-Bond soldering temperature when the LED dies and TPG fins were attached. This TPG-embedded aluminum heat sink base is a TC1050 heat spreader that can be made via brazing or diffusion bonding processes. With the heat dissipation assist from the TPG tile in the heat sink base, in combination with the S-Bond-joined heat sink fins, the measured thermal resistance of Design 3 was 3.0 oC/W, another 24% reduction as compared to Design 2 (see Figure 3). Thermal simulation conducted on Designs 1, 2 and 3 with input power of 15 W per LED (30 W total) is illustrated in Figure 4. The simulation results showed that the TPG S-Bond soldered fins in Design 2 reduced the temperature gradient along the fins; hence, increasing the effective area dissipating heat to the air circulation. 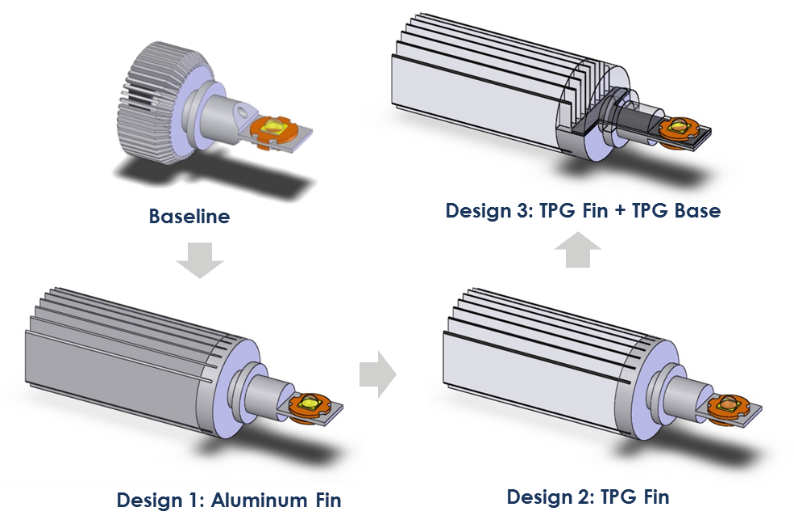 In the case of Design 3, the T-shape TPG tile in the heat sink base further decreased the temperature gradient between the LED die to the heat sink fins. 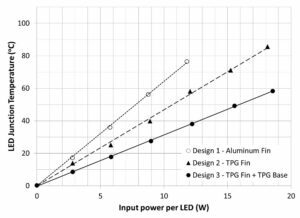 Compared with Design 1, the combination of the TPG heat sink fins and TPG heat sink base in Design 3 allowed a significantly lower LED temperature. These studies, conducted by Momentive on its TPG materials and components, have shown that S-Bond metallization and soldering presents a key element to the manufacture of LED headlamps with improved cooling. If you want to learn more about joining TPG materials, or to otherwise fabricate thermal management components, please Contact Us at S-Bond Technologies or Contact Momentive for data and information on their TPG materials and/or devices. *TPG and TC1050 are trademarks of Momentive Performance Materials Inc. This entry was posted in Graphite Bonding, Thermal Management, Thermal Pyrolytic Graphite (TPG) and tagged graphite, thermal management, TPG by sbondadmin. Bookmark the permalink.